Look carefully! Something’s not the same… Solve the find-the-difference puzzles on every page and learn something about our colorful world at the same time. 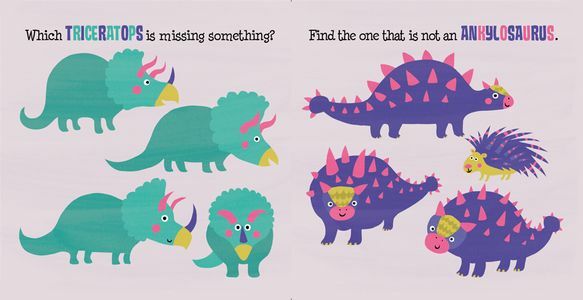 Find the stegosaurus that looks different. Are they all brachiosaurus? Find the sleeping plesiosaurus. One of a series of sturdy look-and-find board books for the very young featuring playful introductions to animals and nature. Ideal for multiple readings and eager young hands! Fun and (sometimes) silly illustrations. And a playful way to discover the world! Ordered this book to accompany another book I ordered for my nephew for Christmas. Company was out of stock and immediately emailed me that the book would be back in stock later in the week and asked if I’d like to hold up order shipment a few days to wait for it to come in. Very kind. They even picked up that I had entered shipping address incorrectly! What great customer service!